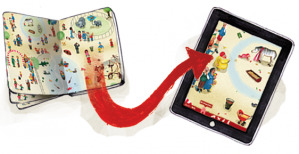 The makers of the Wimmel-App grew up with the famous, Wimmelbilderbücher‘ (which roughly translates as ,teeming-picture books‘). In Germany, they have been a well-known source of entertainment for children from about 18 months. Today, these books have fallen a little bit out of fashion, while we still like to remember those good times in which our imagination and our spirit of exploration were inspired by the small painted worlds. Nowadays, even the youngest are intrigued by new electronic media, so the idea was quite obvious to transfer this valuable pedagogical childhood memory onto a modern medium that is characterized primarily by its tangible and easy operation. As opposed to most of the apps and software solutions for children today, we deliberately focused on a very natural and real adaption of the ,Wimmelpictures‘. The illustrations in the app come from the Augsburg-based illustrator Martin Hartmann. They all have been drawn and colored by hand – quite the old-fashioned way. Computers were only used for the finishing process, and to eventually transfer the application to the iPad.